I found this on one of my Mom's CD's. When I think "Moody Blues" I think "soft rock," I think "Crosby." But as it turns out, they burst onto the scene in 1964 with their version of this song, and it's awesome. It's old-school brit-pop of the best sort, and I've been listening to it nonstop for the last week or so. I doubt I'm unearthing a forgotten gem here; after all, it was a #1 single in the UK. But I hadn't heard it, so maybe some of you haven't yet, either. Enjoy, this post is mainly to add a little roughage to the next week or so's posts, which will contain almost entirely very long psychedelic rock. 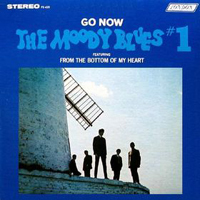 Here's "Go Now" by the Moody Blues. Yes, this is much different than their later stuff. Denny Laine (who sings this song) later recorded with Paul McCartney in Wings. Thanks! Actually, at least during the Wings Over America tour 30 years ago, they did this song with Denny Laine on vocals. I saw them at MSG back then and I think you can find the song on the 3 disc set of the tour. WhWhat's the difference between jazz and blues as according to music theory? Politically, blues reacts in the same manner as folk in the sense that it tends to represent the economic and social frustrations of the lower-class. In my opinion, blues is more representative of the working-class and destitute in contrast to mostly conformist melodies of jazz. Now that we know the differences in a political sense, I want to know how jazz differs from the blues as according to music theory. The Moody Blues formed on 4 May 1964, in Erdington, Birmingham, England. Ray Thomas, John Lodge, and Michael Pinder had been members of El Riot & the Rebels. They disbanded when Lodge, the youngest member, went to technical college and Michael Pinder joined the army. Michael Pinder then rejoined Thomas to form the Krew Cats. The pair recruited guitarist/vocalist Denny Laine, band manager-turned-drummer Graeme Edge, and bassist Clint Warwick. You can't put an animal raised in captivity, in it's alleged natural habitat. I bet so much money this chick wouldn't last in the wild for more than 5 days. If she didn't take herself so seriously, this could be a funny piece of performance, but instead it's kind of embarrassing. I would like to appreciate the great work done by You, its a nice blog to comment on. I love the information in this blog, I wonder if there are updates to this post, thanks. You are too great a writer man. I am in love with all your articles and wait for them to appear. But, this article of all that you have written until now is my personal favorite. I shall surely have the same article forwarded ahead and spread the information to one and all. some of you haven't yet, either. my God, i thought you were going to chip in with some decisive insght at the end there, not leave it with �we leave it to you to decide�.